When I was in high school, if at any point my emotions started to boil over, I employed a small act of rebellion to blow off steam. Instead of screaming or slamming doors or breaking fragile objects in those moments, I would grab my car keys and go for a drive. With no shoes on. Barefoot driving was one of my earliest attempts at true self-assertion. I wasn’t going anywhere (Ozark and back, most likely) and I didn’t ask permission (huge transgression, ps. ), but the risk of eventual trouble was absolutely worth it. For those few minutes, blasting the radio and gripping the steering wheel, I felt like I was in control. …Tonight was a barefoot driving sort of night. Feeling too restless to sleep / Facebook / cry / snack / go on a cleaning bender (my grown-up go-to steam-blowers), I worked out my emotions on Kearney Street. Going nowhere, but still in control. Not a bad feeling at all. When I got home, however, the restlessness returned. (You can drive away from your problems temporarily, but they stick around. Damn them.) 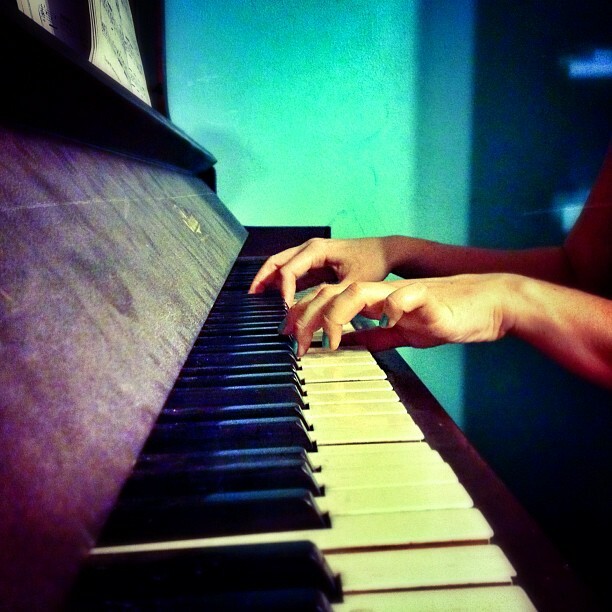 So I turned to another old habit: the piano. I’ve dabbled here & there in the last few years, but it’s been a long time since I’ve felt the freedom of getting lost in music. Not thinking, just playing. Letting go and feeling in control at the same time. Some measures sounded so pretty, I got mad about it. My second grade recital piece, “Country Gardens” — (which made the occasional background appearance on US Acres from Garfield & Friends) — is my go-to party trick, not only because I can play it upside down. (For realizes. America’s Got Talent style.) I’ve had this song memorized for over 20 years, and I can still play it effortlessly, no matter how long it’s been. And it always makes me happy. Like I know something, even if that something is simple and small. Music! A rediscovered storehouse for my restlessness. Now when I feel like boiling over, I won’t have to escape. I can make something out of that stirring in the night. Still barefoot. Different keys. depression hurts, but you don’t have to. I have not been a good blogger lately. Yeesh you guys. Let’s see if I can hop on the wagon again, again. I’ve started watching United States of Tara on Netflix. While I don’t know anything about dissociative identity disorder, I still think the show does an excellent job of portraying how a family deals with the bizarre reality of mental illness. It’s not always Cuckoo’s Nest — some unrelatable insanity that could never happen to you. It’s more often just the mundane details of everyday life, with some bonus weirdness and extra stress thrown in. The careful balance for a blogger is trying to be introspective without over-sharing, walking the fine line between self-exploration and self-indulgence. So I apologize in advance if this post comes off as heavy-handed or TMI or whatever it is we say when someone has been too vulnerable for our comfort level. Consider this the ominous warning scrawled above the cave entrance: If you have a problem with messiness, maybe this is a good time for you to turn back. I have a few things to say about depression. Later, Pete Campbell (man I want to hate that guy…but I can’t) wonders whether his job and family have been “a temporary bandage on a permanent wound.” That stuck with me. Because it’s so sad, and because Pete probably won’t seek help. After all, he thinks that stuff is for weak people. Even though words are my medium, and depression has been a muse (first and second-hand) my entire life, I still find it hard to describe. Not because I don’t have the words, but because there’s a lot of secrecy and shame about it. I find the only people in my life who truly understand depression are those who have experienced it themselves — either personally or in their close circle of family and friends. I know that seems intuitive, and it is, except that I don’t think it works this way for other diseases. For example, I know I don’t fully understand breast cancer because I haven’t experienced it, but I think I do validate its severity nonetheless. And that’s the part that is often missing in reactions toward mental illness. I’m not a trained expert beyond “Intro to Psych” class and lots of reading on my own time, but I am a student of my own experience, from which I’ve learned that this mother-effer is very real and also very misunderstood. There are plenty of people in my life who try to understand me but just don’t understand depression (including some very close individuals). I think they equate my bad days with their bad days. I can feel this unsaid assumption that I’m just not doing it right. If I only tried harder to be positive, this messiness would just go away and we could all go about our business. As if there are some internal bootstraps that I’m just not pulling up hard enough, and if only I were tougher / stronger / less dramatic / more grateful, I would be able to bounce back and move on with my life and my day. The part these people miss is that I do pull myself up by those internal bootstraps, and they are what keep me on my feet much of the time. There’s a whole lot of work that goes into keeping myself from walking through that dark internal door. But sometimes I can’t keep up. It’s not enough. I think the trickiest part for them to understand might be the fact that I’m not like this all the time. I’m very good at putting on my happy face, and what’s more, my happy face is my real face much of the time. I’m the outgoing one. The “funny” one. The goofy-cheerleader-Pollyanna with enthusiasm to spare. But then sometimes I’m not. And then I’m really, really not. Most people don’t really know that. Sometimes I look at my life and the color is gone. That’s not something you can just talk yourself out of. Pharmaceutical commercials might have you believe that depression is a cuddly cartoon robe that follows you around and clouds up your day. Or a wind-up doll that only needs a little boost to get back on its feet. Wouldn’t that be nice. Drugs can help, but they can also bring their own complications, and drugs alone aren’t enough. There’s no magic pill or mantra or book or therapy session or caring word from a friend that will make it all better, though all these things are vital. Pulling up on the bootstraps is vital. So I keep doing it, even when I feel like I can’t anymore. I think I need you to know that this isn’t a thing I choose to do because I can’t handle life. This isn’t a thing I choose to do because I think it makes me more interesting. This isn’t a thing I choose to do because I think it makes me a better writer (though, I can only hope, someday it might…lots of the good ones were crazy, after all). I share all this with you because after a while it’s exhausting to put on that happy face and still feel so misunderstood. And maybe somebody else out there needs to know they aren’t alone. You don’t have to wait for the end of the tunnel to find some light. 1) Long ago, I used to write more. Thanks for reminding me. 2) Longer ago I used to do this weekly post called “Things I Love Thursday”… a quick list of non sequitur happies that happened to cross my mind that day. Today I remembered I liked this idea. So here we go. TILT blast from the past. No repeats. Just rhymes. Mark Twain, you dog you. Genius. And I’m sure he just wrote that on a napkin once or something. 2) Happiness is watching my (indoor) cat enjoying her first bites of indoor-cat grass. (Yes, this is a thing, non-cat-people. One can buy special Chia-like items for one’s non-Chia Pet pet, so that one’s pet can get her munchy greens on and — a girl can dream — leave fewer surprise hairballs around the home. Even if the science doesn’t work out, her pure joy at discovering she’s allowed to chew this houseplant is worth the $5.99 or whatever Target took me for. So much purring. I love this man. I say it a lot. But any time I’ve missed a few days of Daily Show, I always feel this happy tingle when we reunite anew. That show is food for the brain. (It’s a bit of tasty grass for my mind after it’s been cooped up indoors for too long…). 4) Speaking of that. The other day in traffic I noticed a new take on an old classic. It’s been a while since I’ve seen a Calvin-peeing-on-something car decal. Been replaced by family stick figures and dedications to dead loved ones, I suppose. But this one, a truck I was following on Kearney, was no ordinary Calvin. This one had Obama’s face on Calvin’s body, and it was peeing on the word “Republicans.” Oh dear lord. But below it was some bumper sticker declaring “voting Republican is like [some cheeky slam that would typically appear on a bumper sticker like this. I’m out of imagination right now, but you get the drift. ]” So I realized there was much more to this story than meets the eye. That means life is bringing all the hits: party dishware at Target, summer cocktails at Mudlounge, sunny sunsets for running, gatherings in backyards, sandals… Even though there’s no beach in my immediate future, I’m trying to dig my toes into warm mental sand as often as I can.